If I could only choose a couple of books about the Harry Potter series to own, these would be right up there. 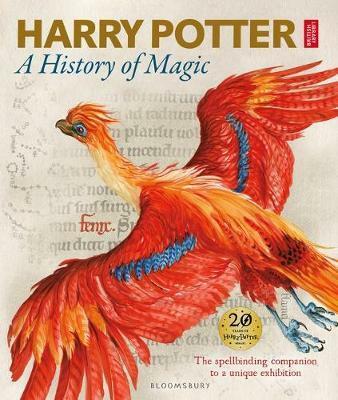 Released as the official books of a major exhibition at the British Library with the same name, Harry Potter: A History of Magic and Harry Potter: A Journey Through A History of Magic are a fascinating insight into the the world created by JK Rowling in her books. Settle down for the long haul when you start to work your way through the 250 odd pages that is Harry Potter: A History of Magic. It's surely the ultimate companion to the Harry Potter series. It's big and it's jam-packed with many manuscripts, objects, artworks and other items held by the British Library. One of my favourite items in the book, though, is towards the end. It's some of JK Rowling's handwritten notes -- a table that outlines her plot. This shows just a little of the amazing detail that went into planning the stories. There are nine chapters in Harry Potter: A History of Magic, each beginning with a short essay by an expert of some kind (writer, director, historian, wildlife expert, priest, and others). The first chapter is an introduction to some of the key concepts in the stories. The next seven each focus on a subject studied by students at Hogwarts, like Astronomy, Charms, or Care of Magical Creatures. In the Herbology chapter, what you find includes a drawing by artist Jim Kay of one of the Hogwarts greenhouses, and a reproduction of an advertisement for the real life Nicholas Culpepper's English Physican and Complete Herbal, a book first published in 1652. There's also a 12th century remedy for snake bite! The final chapter is called 'Past, Present, Future' and touches briefly on the journey from the first draft of Harry Potter and the Philosopher's Stone, to the most recent incarnations of the Harry Potter universe in Harry Potter and the Cursed Child, and the movie Fantastic Beasts and Where to Find Them. There's an excellent balance of text, drawings, diagrams, scripts, photographs, and many other formats of material shared within the book. It also comes with beautiful black and white drawings of Hogwarts on the endpapers. And under the dust jacket with its brightly coloured phoenix, slithers a rather large snake. 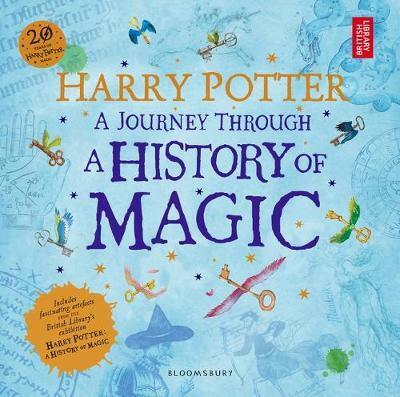 Whereas Harry Potter: A History of Magic is for an older audience, predominantly teenagers and adults, Harry Potter: A Journey Through A History of Magic is for younger readers. It's perfect for primary school aged children, and really makes you feel like you have been on a visit -- a journey -- to the British Library's exhibition. Set out in a similar way to the first book, this steps through 'the Hogwarts curriculum' with detailed information, drawings, and examples of objects from the exhibition (many in this book are also included in the first). They demonstrate how real life facts, myths and legends played a part in creating a fictional story. Kids will love seeing JK Rowling's handwritten version of the Sorting Hat song, and some pages from early drafts of the books. It seems that JK Rowling can also draw well -- her drawing of Harry with Dumbledore, Hagrid and Professor McGonagall is pretty impressive! These items are mixed in with factual and historical information, showing how they were used in writing the stories. Did you know that Bellatrix Lestrange was named after the third brightest star in the constellation Orion, and the name Bellatrix means 'female warrior' in Latin? Or that troll is an Old Norse word and first appeared in Scandinavian folklore? Harry Potter: A Journey Through A History of Magic also includes themed activities. For example, it explains how to find Sirius (the brightest star visible from earth) in the night sky, how to make a colour-changing potion using lemon juice or vinegar, make your own dragon egg, and perform a magic trick using a banana. This book is well designed and appealing, with lots of visual elements and breakout boxes. It could be read from cover to cover, or you could open it at any page and dive right in. Harry Potter fans will all find something they recognise. Both books from the exhibition have lots in common, but are also quite different. While the first is a coffee table book that older readers will enjoy browsing, the second is easily readable by younger children (and adults) and offers many hours of entertainment and learning. I highly recommend Harry Potter: A History of Magic and Harry Potter: A Journey Through A History of Magic and will gladly revisit both books. They would each make an excellent gift for Harry Potter fans or book lovers in general, and a great tool for writers looking for inspiration, or ideas for their own research and creative processes.